UnifiedCommunications.com provides communications and collaboration devices and strategy to Microsoft partners and end customers around the globe. Its business received a big boost when Microsoft enhanced Office 365 with new communications services. More partners than ever now want to sell Skype for Business Online, and UnifiedCommunications.com expects to expand its hardware sales by 40 percent in 2016. With help from UnifiedCommunications.com, partners can deploy Skype for Business Online in a matter of weeks. For more than 30 years, UnifiedCommunications.com has been outfitting organizations with the equipment needed to run state-of-the-art unified communications systems. This includes back-end gear such as gateways and load balancers, and front-end gear such as phones, headsets, cameras, and meeting-room devices. UnifedCommunications.com works with Microsoft partners to provide devices and equipment to their end customers. In addition to selling devices worldwide, UnifiedCommunications.com provides device strategy consulting and a partner-branded web store where customers can shop. A wide range of fully tested Microsoft-certified hardware devices that it sells directly to partners’ end customers. UnifiedCommunications.com handles transactions, billing, and shipping, and shares profits with the partner. A web store that is cobranded with the partner’s logo and further individualized for its large end customers. 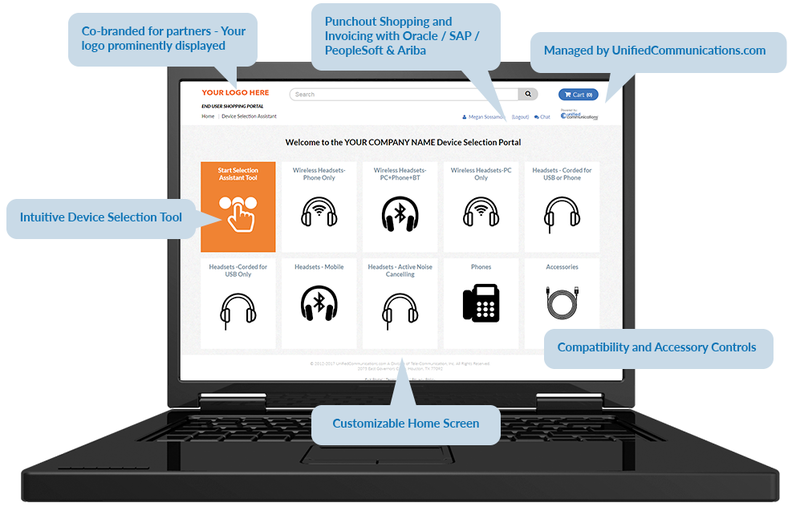 More than just an online store, the UnifiedCommunications.com web store walks customers through a series of questions that guides them to the best possible devices for their needs. Device strategy consulting, which includes initial assessments, device pilots, feedback forms, device standards reviews, ongoing device program management, and device support. Herbst says that Microsoft is headed right where customers want to go: an end-to-end Microsoft productivity, telephony, and collaboration solution. “Since the December launch of the new Skype for Business Online voice and meeting services in Office 365, we’re seeing an unprecedented level of interest among our customers in moving from their on-premises communication solution to Office 365,” says Herbst. There is a real opportunity for partners that haven’t previously offered Skype for Business Online. “We expect to grow our sales of devices and hardware associated with Skype for Business Online by 40 percent in 2016 and expect that number to grow by an additional 50 percent next year,” Herbst says. The higher-velocity deployment of Skype for Business Online (than either traditional telephony solutions or on-premises Skype for Business Server) also boosts profits. UnifiedCommunications.com and Microsoft are helping more partners quickly sign up and engage new customers, which translates into more device and meeting-room sales which benefits partners, customers, and UnifiedCommunications.com. The extensive array of hardware, device, and meeting room options can be overwhelming to services–focused IT partners, but deploying the right mix is absolutely critical to a successful unified communications experience. Working together with Microsoft, we have significantly reduced the barriers to entry for new partners getting into the Office 365 and Skype for Business Online markets.